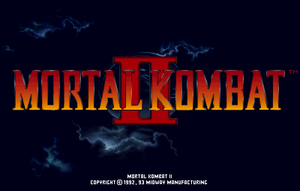 Mortal Kombat II is the sequel to the well-known arcade game Mortal Kombat. 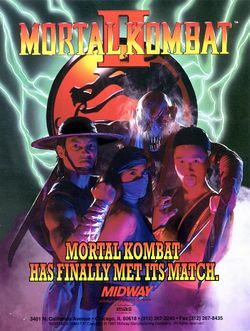 Essentially, Mortal Kombat II is an extension of the original fighting system, adding new moves (such as a close high punch and a crouching low punch) as well as new special moves for returning characters. On top of this, multiple fatalities were given to characters, even brand new stage fatalities and amusing finishing moves such as babalities and friendships. Each character still shared generic attributes - speed, power, jump height and airtime - and all normal moves were similar between each character. Mortal Kombat II also dropped the original system of points, adding a win tally meter instead. The game features twelve playable characters, each of them with different special moves and fighting styles. Each fighter still shares a common pool of regular moves (e.g. down and high punch performs an uppercut for every character) as well as attributes. Once the player chooses a character, he or she must face twelve other combatants (including yourself) until they reach the two bosses (a sub-boss named Kintaro and the final boss: Shao Khan). This page was last edited on 30 May 2016, at 13:27.